You know those movies where there’s a comet that’s going to smash into planet Earth and the characters have only 24 hours left to live? Well as a foodie, I always have one burning question… what they would choose as their final meal? (Don’t laugh!) If it were me, I have no doubt that I would choose a curry! My only quandary would be, which curry to choose? You see, the more I explore, the more I realize that there is a whole world of curries out there, and honestly I love them all! I think it’s the spicy complexity that I am enamoured with, and how each exotic spice blend gives the dish a different character. Recently I discovered that Japanese cuisine has its own curry. I noticed it in a few blogs that I follow and then I found this enticing recipe in “The Flavour Principle” by Lucy Waverman and Beppi Crosariol, and just had to try it. This is a rich, fragrant curry that has the added sweetness of some chopped apple. The recipe called for the dish to be served with cucumber pickles, which added the perfect amount of acidity to the meal. My husband and I both loved this recipe, and I know that I will make it again. I hope you like it too. I have included the recipes for the Japanese curry powder and the cucumber pickles, so that you can enjoy the whole experience! Well, you know that I am going to share my curry with the gang at Fiesta Friday! Since we have been partying for a year now, I am certain that many of my friends love curries. Please join us at our host Angie’s site, The Novice Gardener. I know that you’ll make this part of your Friday routine! Cut the chicken thighs into 2 – inch pieces. Season with salt and pepper. Heat 2 tablespoons oil in a large skillet over medium-high heat. Add chicken in batches and sear for a few minutes until lightly golden. Set aside. Reduce heat to medium. Add remaining 2 tablespoons oil and onions to skillet and sauté for 2 minutes or until the onions are softened. Add apple, curry powder, ginger and garlic and sauté for one minute or until fragrant. Stir in the flour and cook, stirring for 1 or 2 minutes to cook out the floury taste. Stir in the stock a little at a time until well combined. Bring to a boil, stirring. Reduce heat and simmer for 2 minutes to thicken. Taste and adjust seasoning. Return the chicken and any juices to the skillet and cook in sauce for 10 minutes, or until the meat is cooked through. Add sherry wine vinegar one tablespoon at a time to taste. Stir in spinach and cook for 1 minute, until the spinach is wilted. Serve with rice and garnish with cilantro just before serving.This dish is very nice served with cucumber pickles, featured below. Combine all spices in a small bowl and stir well. Keeps well in a sealed container. Cucumber Pickles. Perfect with this curry! 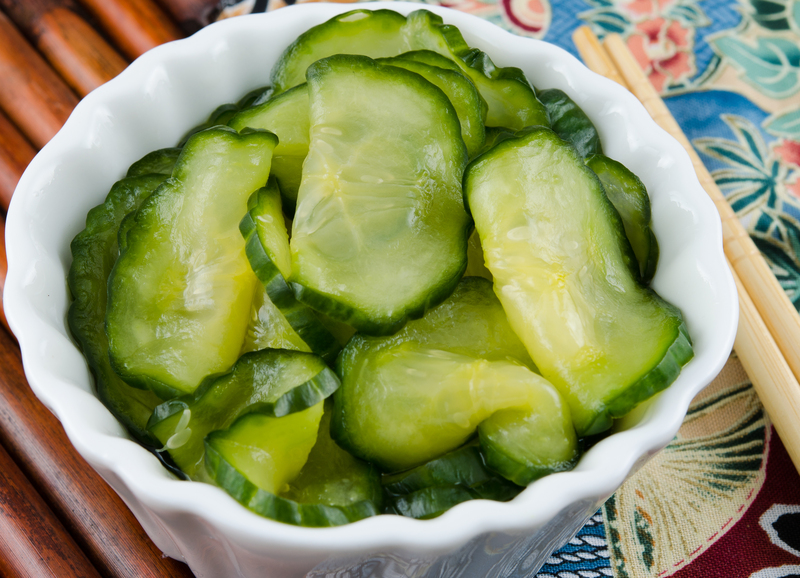 Toss cucumber slices with kosher salt. Place in a colander and let sit in the sink or over a bowl for 15 minutes, or until the cucumbers are wilted and much of their water has been extracted. Press on the cucumbers to squeeze out remaining liquid and pat dry with paper towels. Transfer to a bowl. Add rice vinegar, mirin, and sugar and toss to combine. 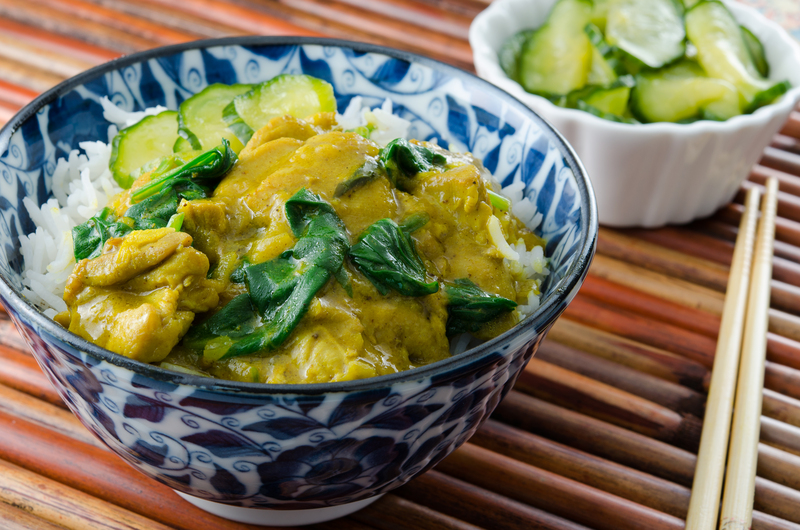 Serve this beautiful curry with fluffy white rice and cucumber pickles. Thanks so much, Johanne. It’s fun to learn about new curries! Glad you like the look of this one! I love this chef! I have a very close Japanese friend and she used to make for me a veg Japanese curry with her curry powder/paste. Absolutely delicious. And love those cucumbers too! Welcome to the fiesta! Have fun and see you around :). I sooo need to try some more curries! If you love them so much Julianna, they have to be something worth trying! Love this! Hope you get a chance to try this one, Lori! I think you will really like it! This is so getting bookmarked! I’ve never had a Japanese style curry before, but this looks super tasty & easy. I’ve not had a Japanese curry for a long time – it looks really delicious. Wow, you made Japanese curry from scratch! I am a Japanese and I love Japanese curry!! One of my comfort food. But I use Japanese curry paste block… shame on me. If anyone interested in Japanese curry, and not that great at curry making, you can buy Japanese curry blocks (in a box) at Asian supermarket type place. Many Japanese use to it make curry at home. But some proper curry lovers in Japan also make curry from powder, or add own powder mix to shop bought curry paste block. Great looking curry, Julianna! My eye are fixed to your cucumber pickle… mouth watering. It’s been ages since I have had Japanese curry and I have never made it, but this looks really good so I might have to try soon! 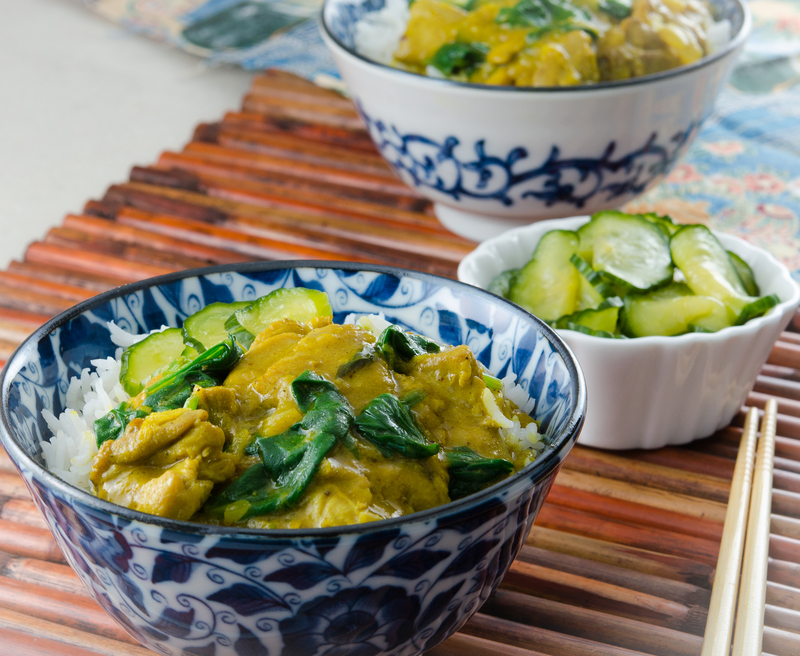 We are big curry fans in our house so always good to have another recipe to add! So happy to supply you with another recipe! This sounds like a wonderful dish with all those spices! Glad you think so, Nancy! Parece que el olor del curry nos llega mirando la foto, la receta tiene un aspecto estupendo y el encurtido de pepinos me parece muy fácil de hacer y probaré alguno de estos días. Curry is definitely a good choice of last meal, especially this one it looks delicious! We must be kindred spirits then….or just fellow foodies with good taste! 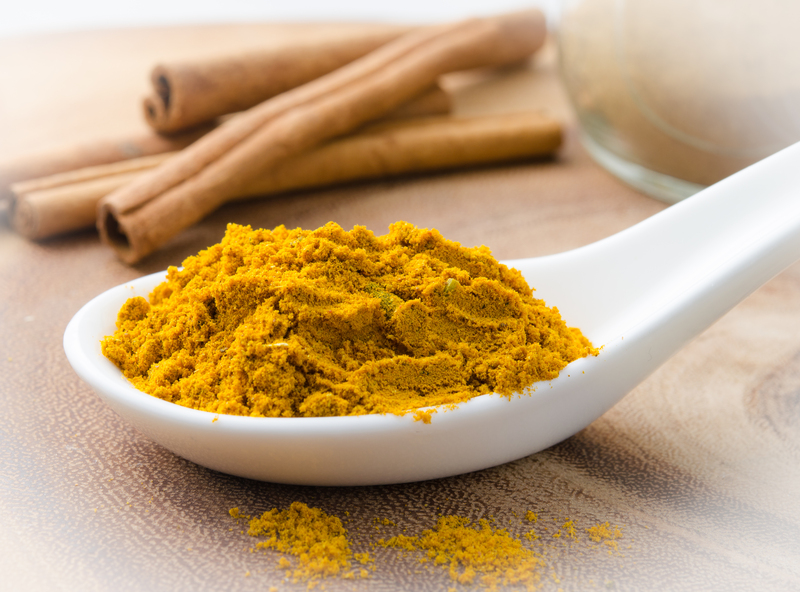 Thanks for sharing the recipe for the curry powder mix. I cook lots of Indian curries, but when it comes to the Japanese derivation, I always opt for the pre-made spice packs! I love Japanese curry but had never thought of making it. But you make it sound so simple with a homemade curry mix. Yum! I like to make the curries from scratch! I find that they are fresher, so the flavours are just more vibrant in the cooked dish. Glad you like this! Yes, Yes, YES! This curry sounds amazing. I especially love the cucumber pickles. Was having a heated conversation about pickle on the weekend, my friend was adamant he made the best pickles around. Will have a crack at yours and see what he thinks. Also, go you naming the last dish you would ever eat, I think I would try make as many of the foods on my list in that last 24hrs, rather than try decide. LOL! Happy Monday and a great week ahead to you. Thanks so much, Bonnie! Glad you like it! This looks scrumptious! One of my favorite dishes! Your dish looks so delicious I got hungry, went to the oven and took my fish out that I was cooking for lunch. It took a few bites before I realised it wasn’t quite cooked, I was so busy reading your recipe! I will cook it, this coming week if I get the time, it looks so delicious! This dish is just beautiful! Both to look at and all of the great flavors and textures. I’ve never tried Japanese curry and I love how easy these pickles can be prepared for any meal. congratulations on getting featured on FF! That looks awesome! 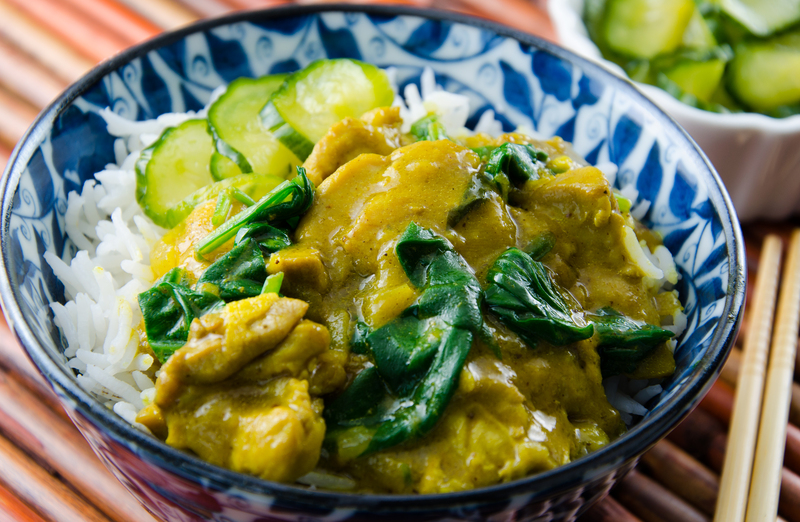 I like the combination of spinach and chicken in curry. I think most curries have similar ingredients! I didn’t even know that the Japanese made curry! Thanks for sharing the recipe. I have bookmarked it to try it soon! I love Japanese curry and I love that last shot you took of the curry powder!